Music Costs > How Much Does a Violin Bow Cost? How Much Does a Violin Bow Cost? One expense of playing the violin is replacing or even buying a bow for the first time. A bow should be replaced about once a year, depending on how often you play. On average, a violin bow can cost as little as $10 to as much as $150 or more. It’s also not uncommon to see professionals spend $300 to $550. The cost will depend on the brand, quality, type and where it’s purchased from. If you’re a serious player, experts will recommend taking 30 percent of your violin price to determine how much you spend on a bow. For example, this full-sized 4/4 Pernambuco Nickel/Silver violin bow retails for $35 to $80. This particular brand is nickel/silver mounted and is fully lined. It’s also made of a pernambuco wood made with Mongolian horsehair. The most important components of the bow are the stick, the head, and the frog and button. The stick is what the violinist will actually hold on to, and the frog is what holds the end of the hair. The button places the correct amount of tension on the hair, and the head is what holds the hair in the bow. All of these components should be masterfully combined in order to offer the best sound quality. There are a variety of bows available on the market, from those made from synthetic materials like fiberglass to wood such as a Brazilwood or Pernambuco. Fiberglass will be the cheapest option and can be found with most student violins. Brazilwood will be made from a tropical hardwood and can also be seen with beginner and intermediate players. Pernambuco is known as a heavy wood that comes from Brazil and is noted for its strength elasticity and responsiveness. These bows are known to be the best but also the most expensive type due to its rarity. Carbon fiber is another material that’s relatively new to the market. This material is sturdy and can react very little to temperature changes. The shaft of the bow will come in two shapes: octagonal and round. Round will tend to be the most popular on the market, but many players prefer the octagonal type due to its stiffness and flexibility. Reputable companies should include some sort of warranty that covers defects. These warranties, however, won’t cover replacement of the hair. If you want to buy the hair on its own, but you don;t know how to replace it on your bow, you may need to visit a local music studio or professional to help you. Most will probably charge $20 to $40 to re-hair it. Rosin will be necessary to make sure there isn’t a scratchy sound coming from the bow. Rosin will usually cost anywhere from $5 to $20. Each bow is going to have its own “sweet spot.” If you have a harder time finding this spot, talk to a professional to have them help you find it. Don’t tighten your bow hair too tight as you want to keep it slightly loose. When you over tighten a bow, it may leave too much tension, causing the tone to slightly be off. Don’t apply too much rosin on your bow. If too much rosin is applied, the sound can be thrown off. If too little is applied, a scratchy sound can be heard. Even with the proper amount of rosin and having the bow strings tightened, the sound can still be off due to the grip. 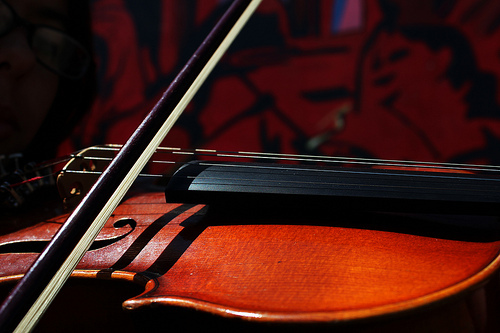 If you’re having a hard time getting the right sound, it may be best to meet with a professional violinist. Yes, the bow does matter. Feinviolins.com has some interesting videos comparing bows on the market showing you how each one sounds. They not it’s not because of the different fittings but it’s due to the quality of the wood. A good bow should be made from a quality wood such as Pernambuco. Before purchasing, visually check the bow to make sure it’s straight from end to end. If it’s curved, the shaft may hit the strings. Also, test the strength of the bow by pulling your violin across the strings with slight pressure. While doing so, pay attention to the shaft to see if it comes in contact with the strings. If you are just learning how to play the violin, buy a cheaper bow until you know for sure if you are going to stick with it. Inspect the bow in person before committing to one. You will find many music studios will allow you to play it before purchasing it. Some may even allow you to bring them home for a few days. Buying just the hair is cheaper than buying an entirely new bow. See online tutorials on how you can replace the bow hair.